so pretty. I love it!! Love the room and really love the lamp base. May I ask where you purchased it? It was a Homegoods find awhile ago…thank you! Hello, I love the nursery concept — colors and all. What color is the paint on the wall and where did you purchase the poms? Pink and orange are the colors of this year, so really great choice! 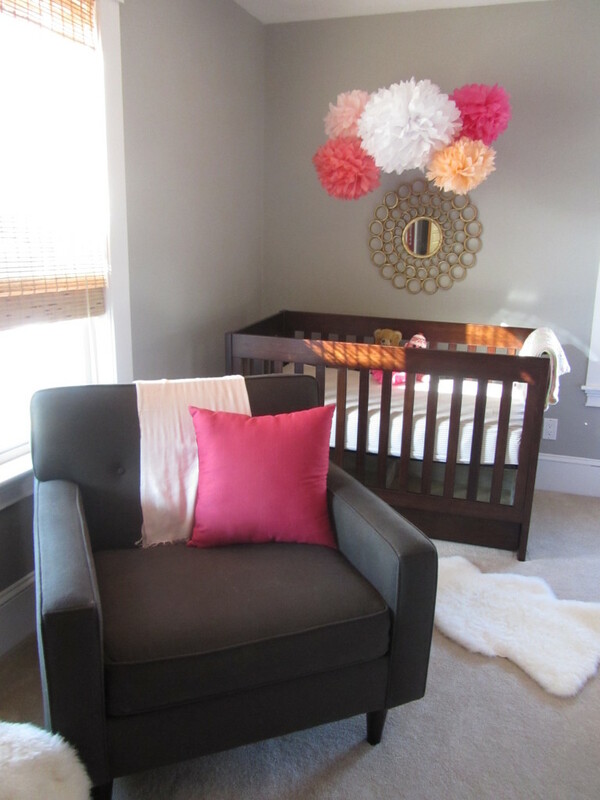 You created such a bright, beautiful and charming space, which is perfect for a darling baby girl. How big is the room (dimensions)? I love the lay out and the inclusion of a bed! Adorable! Just wondering how you attached the tissue poms? I have some from a party I’d like to attach safely above my daughter’s crib! The poms are attached with monofilament line and screwed into the ceiling. Then I dabbed them with ceiling white paint. They are pretty secure! The color is Benny Moore Ozark Shadows and the poms are from Etsy, Fiesta Pom Pom. She is priced well and has tons of colors and sizes. The room is about 16 x 16 so I was lucky that I could keep the full size bed to use for company! Thanks Erin. I found a color by Glidden called Feather Grey. It has a purple tone to it and looks great — just tested it yesterday. Great – good luck with your space! Love it! What is the exact name of the wall color you used? Love! Where did you get the baby sheets and pillows! love the color combo. Love it! Where did you get the chair?? Hi. Love the whole decor – beautiful! Can I ask where you purchased the crib? Love the modern, dark style and have been searching for the perfect one. I really like yours. My daughter is having her first baby at the end of June and fell in love with your room. We used it as our inspiration with a slight twist. It turned out beautifully. Thanks so much for sharing. Love this! Wondering where you got the dresser? I was wondering what color poms you ordered from Fiesta Pom Pom? LOVE THIS!! WHERE DID YOU GET THE WALL ART?? I love this idea! What color pink did you use for the dresser! ?